My Fitness Journey has been a long one with its ups and downs. 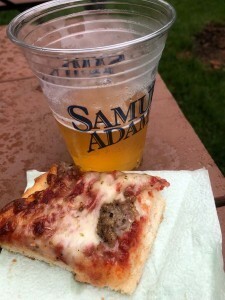 I’ve written some posts over the years and I’ll go through stages where I’m committed to diet and exercise and other times where its not so much. I think there are a lot of people out there that can relate. My wife (Blogger at HealthyPhat) has been into running for over a year and go into the Chicago Marathon this year which will be a milestone for her and her journey. What’s funny is that when we look back at our fitness journey together, I was the one that tried to get her into running when we first joined a gym. She thought I was crazy. Now she loves it and she’s the one inspiring me. Running has always been tough on me since I’ve been overweight most of my adult life and the fact that I’m 6’6″ means it takes my body more work to achieve the same speed and distance. Late last year (2017), I decided I want to try doing a triathlon where you swim, bike, then run. I have no idea where that idea came from, but the more I started watching videos, the more I got inspired. My family and I watched the Ironman Championships in Kona and it looked amazing. Keep in mind, I was still overweight and I haven’t swam or biked since I was probably 13 years old. Am I crazy?!? I pulled the trigger anyway and signed up for the Chicago Triathlon Sprint Distance for August 2018! 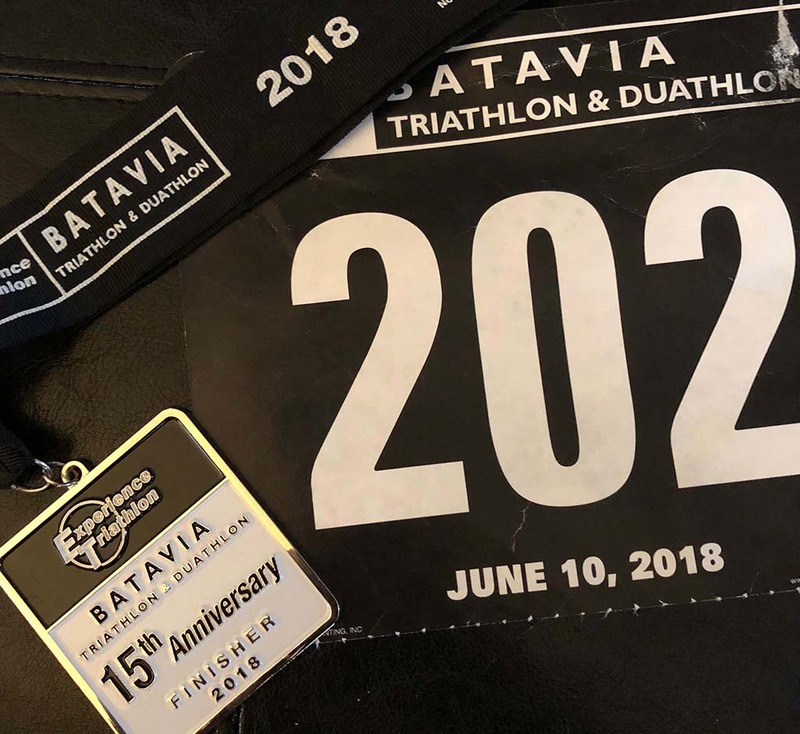 A few weeks later, I started looking up other triathlons and I came across the Experience Triathlon Batavia Sprint Triathlon in June 2018. I decided to register for that one too since it was a smaller event, early in the season, and enough to get some experience before the big one in Chicago. But wait! After registering for that one, I see a Triple Challenge on their website! I could sign up for the Batavia, Lake Zurich, and Naperville Triathlons and get a special medal after completing all three. They were all about a month apart, so I did it and signed up for all three. What did I get myself into? I’ve never completed a triathlon and here I am signing up for four in one summer! The more I read about triathlons the more I learned and I found out there’s a group made just for me and they’re called Clydesdales! Being as tall as I am, I’ll probably never be under 220lbs unless I want to look sickly and I would be perfectly content if I ever got to 220lbs, which would still be in the Clydesdale division. Unfortunately, not all triathlons recognize the Clydesdale division and only go by age groups. Out of the four triathlons I’m registered for, only Lake Zurich and Chicago have a Clydesdale division. The first thing I realized was that the Apple Watch Series 2 that I was currently using wasn’t the best watch for triathlons. If you’ve been around my blog, then you know that I’m a sucker for gadgets and data. I decided to buy the Garmin Forerunner 935 watch. For a while, I actually used both the Apple Watch and the Garmin at the same time, but after a few months I ditched the Apple Watch and have only worn the Garmin. I love the amount of data the Garmin 935 gives me. Since my wife and I already had a gym membership, I got myself a pair of goggles and started swimming in their pool. I knew I would have to swim in open water, but the pool was the only thing accessible to me at the time, so that’s where I got all of my practice in. What’s next? A bike of course! I knew I needed a larger frame given my height. 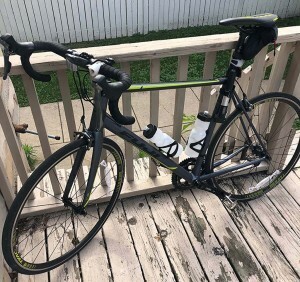 We went around to a few sporting good stores and realized they didn’t have anything that would fit me right, so I went to a local bike shop and bought this 2018 Fuji Roubaix 1.5 road bike. I got the 61cm frame which seems good for my height. Since it was winter when I got the bike, I also purchased an indoor fluid trainer and did trial subscriptions with Zwift, Rouvy, TrainerRoad, and The Sufferfest over the winter. The trainer rides were rough and I was lucky to last an hour on the bike. I ended up buying The Sufferfest subscription for a few months until spring came around. Next winter I’ll evaluate the apps again and possible consider getting a smart trainer to simulate hills. I also didn’t purchase a Power Meter yet since I didn’t want to go overboard until I knew for sure that this was a sport I wanted to do in future years. Instead, I got the Garmin Bike Speed Sensor and Cadence Sensor . A little later I also purchased the Garmin HRM-Tri Heart Rate Monitor which is pretty cool. It gives me running dynamics data and also collects heart rate data while swimming. I didn’t opt for clipless pedals yet, so instead I knew I was going to put on my running shoes in T1 and bike and run in them. For my running shoes, I went through a few pair since I’ve had some foot issues that I’m still overcoming. I have a small wide foot for my height plus really high arches. The two shoes that I train in (and plan to race in) are HOKA ONE ONE Arahi 2 ‘s and a pair of On Running Cloudflyer ‘s. I track the miles through my Garmin Connect app and I usually look for sales in either brand of shoe. 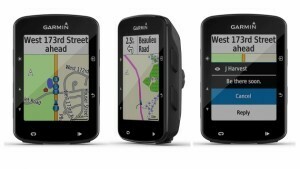 My most recent addition to gadgets was the Garmin Edge 520 Plus GPS Computer for my bike. 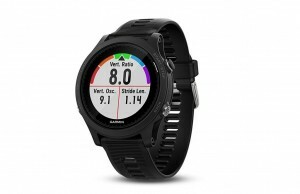 I actually purchased both the Wahoo Elemnt Bolt and the 520 Plus, but decided on the 520 Plus for some of its navigation features and the fact that all of my other equipment is Garmin. I also liked the idea of having the Extended Display on the 520 Plus and my Forerunner 935. For a triathlon, I can start the Triathlon Multisport activity on my watch, then just extend the display to the 520 Plus instead of having the 520 Plus track a separate bike workout. My next purchase will be a wetsuit. At this point, I’m thinking of an inexpensive sleeveless one. It is difficult to find ones that would fit me according to their sizing charts, but I’m sure there’s one out there. I looked online at different training plans and I tried the ones that were built into the Garmin Connect app. I had a trial with TrainingPeaks and also had offers for some free triathlon training plans through them, so for most of the winter I used one of their plans. I had to adapt it to indoor training, but it kept structure for me. I trained in a gym pool that was 25 yards and usually tried to go once or twice per week for an hour doing different drills based on the training plan. This worked out well and helped me build up my speed and work on my breathing. During the winter months, I also did different training drills on the treadmill at the gym. I can’t be on the treadmill for long periods of time because it gets boring to me, whether I’m listening to music or not. One thing that helped me was doing High Intensity Interval Training (HIIT) drills. I wasn’t just going one speed for a set distance. I would change between fast sprints, slow jogs, and walking. For the bike, I used The Sufferfest app and my indoor fluid trainer. Most of the training sessions I did were an hour or less. Once the warmer Spring weather came, I moved my running and biking outside. We have a bike path near the house, so a lot of the training is done there, although I also try to bike on the streets so I can get used to riding with cars because some races aren’t completely closed off to traffic. I also practiced a few brick sessions which is where you bike then transition to a run similar to how you would in a race. 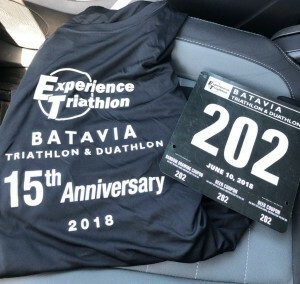 The time finally came for my first triathlon, the Experience Triathlon (ET) Batavia Sprint Triathlon. My anxiety was high during the whole week before the race. I wasn’t expecting to podium, I just wanted to go out and have a good time, but my anxiety and nerves were still high. The Race Director offered a bike course preview ride the weekend before, but for whatever reason, I never got the calendar reminder and missed it. I took my family to the packet pickup the weekend before the race. I wanted to get that out of the way so I wouldn’t have to worry about it the weekend of the race. That’s when it became a reality that I was actually doing this. The Saturday before the race, they offered a swim preview and a race clinic. That morning I was hesitating and debating in my head whether I wanted to go or not. At the last minute, my wife suggested that I go because it might help my nerves, so I got dressed and headed out. I had the time wrong in my calendar, so I got there 30 minutes early, go figure! After I arrived, I was surprised at the venue. I knew it was in a quarry off of a river, but I wasn’t sure what to expect. It looked like a man-made pool with a sandy bottom and only half of it looked deep enough to swim in. There was a light rain, but it cleared up by the time we were allowed to go into the water. I planned on wearing tri shorts and a tri shirt to the race, so that’s what I wore to the swim preview. The time came, and we got in the water to swim a couple of laps. They said the water was about 70 degrees, but it felt cold! The swim started off on the deep side, and as you rounded the corner, my hands started hitting the bottom. The Race Director said that we were allowed to stand up on the shallow side and run back around to the deep side during the race, which is what most people ended up doing. This actually eased my anxiety a little because it was truly an open water swim in a lake. It was fresh water and you couldn’t see the bottom on the deep side, so it was still different than the pool. After the swim preview, the Race Director offered a race clinic where he would go over some of the rules and and transition setup. I enjoyed the race clinic and it helped me learn a lot before my first race. I knew how to rack my bike, where to lay out my stuff and what to bring. Time for race day! Due to the rain on Saturday and road construction, the bike course had to be cut down to only 5.25mi instead of the planned 14.7mi. At my 4am wake up alarm, the thunderstorms were in full force but looked like they should be moving through, so I went outside and mounted my bike on my car, then started getting dressed and gathering my stuff I had staged the night before and headed out the door. About halfway to the race location, the Race Director sends an email saying we’ll be delayed for about an hour due to the thunderstorms. I get to one of the parking lots and there are a few of us sitting in our cars. I still had my Optimum Nutrition Amino Energy pre-workout drink, so I waited to drink that until we got the email saying the body marking and T1 were open. After sitting in the car for an hour, it was time to head towards transition for body marking and setting up T1. I actually felt fairly calm after having such high anxiety all week. I setup my transition area fairly quickly, then I took off my shoes and socks to place them next to my bike. The first thing I noticed was all of the gravel in transition, especially around my bike. Of course I left my flip flops in the car. I practiced walking around barefoot on the gravel since I knew I would have to do it after the swim. I walked to the restroom and back to my bike along the T1 path from the water so I knew which row my bike was in. Oh no, more thunder! We were delayed another 30 minutes. Next time I will definitely have some pre-workout in a water bottle on my bike. After the thunderstorm delay, we were able to get in the water for 10 minutes before we had to line up for the race start. The water was still cold, just like the day before! We all lined up based on our estimated swim time. The distance was 400 meters and I estimated myself to complete it in 8 minutes. We sang the National Anthem, then we began the time trial starts. As the line moved forward, we could watch the swimmers until it was our turn. I got up to the line and waited for the go ahead. As I crossed the timing mat I started my watch and ran into the water and dove in as soon as it was deep enough. And I was off! I circled around my first lap and I stood up in the shallow end and ran back around to the deep water like most people were doing. For some reason I had a small panic attack during my second lap. The cold water made it hard to breathe for a minute so I changed from freestyle front stroke to breast stroke to catch my breath. I was swimming between people and passing people. I got back to the shallow side and ran towards the Swim Out. As I crossed the timing mat, I hit the lap button on my watch to start T1. I didn’t even look to see what my swim time was, I just started running towards my bike. Knowing that it was raining, we bought a thing outdoor hiking backpack that I could fold up in my transition area. Since it was an outdoor bag I thought it was waterproof. I was wrong! I had my shoes and socks in the bag thinking they would be dry. I pulled out the towel to wipe the gravel off of my feet and it was wet. I actually sat down to get the gravel off, then I pulled out my wet socks and shoes. Oh well, it is what it is at this point. I put on my wet socks and shoes. I put on my helmet and I try to dry off my wet glasses with my wet towel. That didn’t really work. I took a drink of my Nuun Electrolyte Caffeine drink I had on my bike and started running towards the Bike Out. I pressed the lap button on my watch again as I crossed the timing mat, and once again, I didn’t even look at my transition time. I knew the bike course was cut short and there were a few hills, including one to start the ride. I didn’t even bother putting my Garmin computer on my bike, but I did grab my phone and put it in my pocket (which is legal this year according to the USAT rules) so my family could track me. I had a few people pass me on the hills and I passed a few people on the flat stretches. The bikers were spread out, so there weren’t many people to catch. Most of the people passing me were on more expensive tri time trial bikes with aero bars. I completed my loop and headed back into the transition area. I found my rack area and racked my bike. I grabbed one of my energy gels and had that along with another sip of my Nuun Electrolyte Caffeine drink, and headed towards the Run Out to begin the 4.1 mile run. Continuing my ongoing trend, I pressed the lap button on my watch crossing the timing mat, but didn’t pay attention to my T2 time. The run was flat on a trail along the river and it was tree covered. I felt pretty good, but as people started passing me, I looked at my watch and saw that I was averaging a 13min/mile, which is quite a bit slower than my usual pace. I would try to speed up, but it never lasted long and when I looked at my watch I was still averaging the same pace. I kept moving though, but I kept thinking to myself how long this run was. As I got to the last mile, I saw people walking back with their medals already. I knew there were still people behind me, so I knew I wasn’t last. Most of them kept telling me “good job” and “you’re almost there”. I knew I was close, I could hear the announcer and people at the finish line. I sped up as much as my body would let me and I turned the corner to the finish line. I did it! I completed my first triathlon! I stopped my watch and saw my time of 1 hour 30 minutes. I had no idea where that placed me, but I didn’t care. I was proud of myself for completing this journey! I walked past the sponsor tents to find my way to the beer and pizza and dropped my tag off in the raffle box. I sat down and enjoyed my post race snack, then it was time for the awards and raffles. I headed over to that area and most of the age group winners had times around 50-60 minutes. I knew I wasn’t anywhere close to that, but it didn’t bother me. There also wasn’t a Clydesdale division in this race. They had some cool sponsor prizes for the raffle, but unfortunately my number wasn’t called. The rain started in again as they were finishing up the awards, but we were all standing out there in the rain and it didn’t bother us. After the final awards were announced, we started the 1 mile walk back to the transition area where I gathered my stuff and headed towards my car. I knew I could have pushed myself harder and after looking back, I could have planned my energy drinks and nutrition a little better, even though it was a sprint distance. I still had a great time and a great experience for my first triathlon, despite the bad weather. Most of the racers were nice and encouraging along the way. 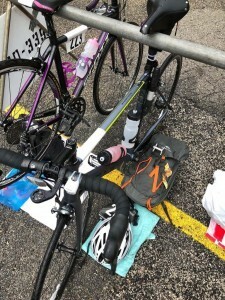 As I mentioned in the beginning of this post, I’m currently signed up for two more sprint distance triathlons to complete the Experience Triathlon Triple Challenge, and those will be Lake Zurich and Naperville. I’m signed up for Lake Zurich as a Clydesdale, Naperville didn’t offer that division. I’m also signed up for the Olympic distance Chicago Triathlon this summer as a Clydesdale. They’re all about a month apart, so the next few months will be busy for me. For training, I’ve decided to start adding distance and focus on the Chicago Triathlon which will be my last race of the season. By training with more miles, the two sprint distances should seem easier. Earlier this year, my wife agreed to do an Ironman 70.3 with me in 2019. After looking at our options, we’re currently considering Ironman 70.3 Muncie Indiana, which would be July 2019. This would give us time to train after the winter months and it looks like a mostly flat course with a completely closed bike course. I’m excited to start that journey with her after our 2018 race season is over.